roasted vegetables | Cooking Ripe! Carrot and Sweet Potato Soup – orange you ready for some soup?? I love orange veggies! 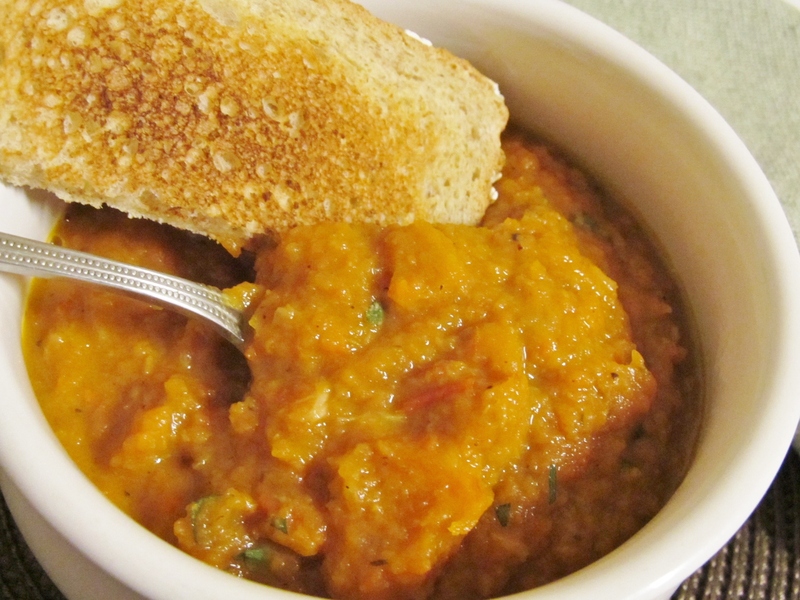 Pumpkin, carrots, sweet potatoes, sweet orange peppers, butternut squash….mmmhhhmmm. They all inspire images of cozy Fall evenings by a fireplace. Comfort. Fall is in the air here in SW Colorado. The nights are cooling off enough to force us to close some windows at bedtime and when we drove up to Telluride this weekend, we saw that the leaves are turning crispy golden colors already. Another sign that Fall is upon us is that the Hubs has a cold. That’s the downside of the season change, right? I’m fending it off, so far, but I feel some sniffles coming on, too. So Fall is arriving and we’re a little sickly, so that means it’s soup season! I adore making soup. There is something so wholesome and satisfying about mixing up a batch of comforting soup and letting it simmer quietly on the stove. I think one of the first real scratch cooking recipes I made was soup – Tuscan bean soup, I believe, and I was amazed how simple it was to make and how yum-o it was to eat. The Hubs requested chicken soup over the weekend and we finished it last night, so I wanted another soup recipe for tonight. My kitchen is overflowing with veggies from the garden and from my most recent Bountiful Baskets haul, so I assessed what I had and started my daily trolling of Pinterest for ideas. I found it: carrot soup! I have tons of my own garden carrots and also two packages from Bountiful Baskets. 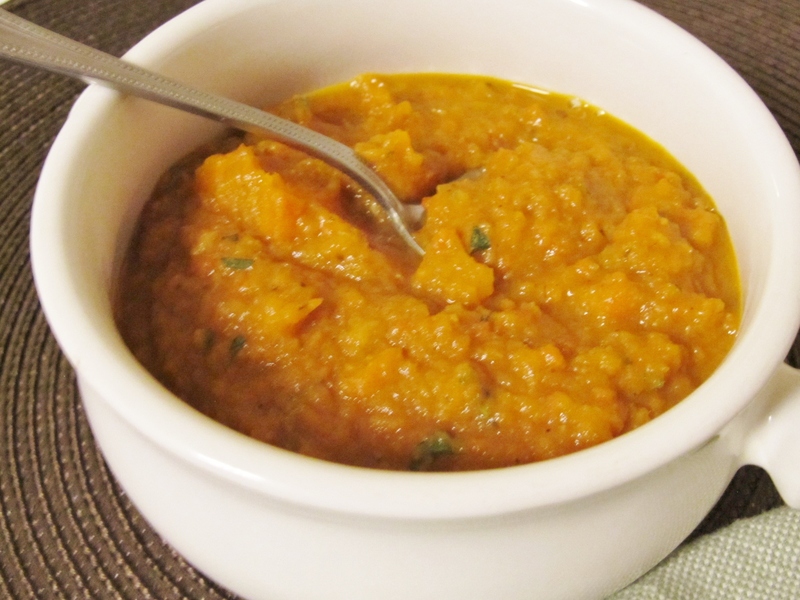 I’ve never made carrot soup, but I have made pumpkin soup and it sounded similar – and it’s orange! YAY! My inspiration recipes are from Basket 411 (which I’m glad I found because it’s all about using Bountiful Basket produce) and from Food 52. I stole borrowed a few ideas from both and made my own version tonight. 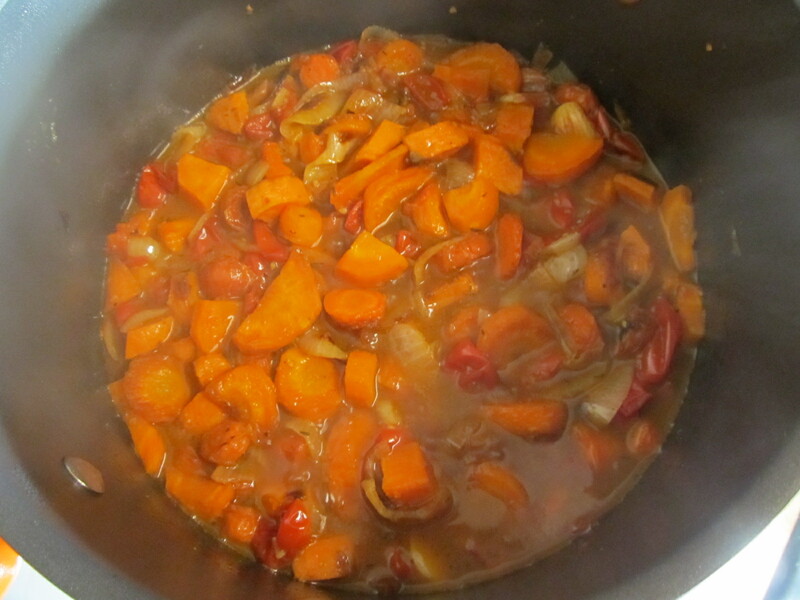 It turns out that I got to combine the carrots with another orange veg: sweet potato (or yam)! Orange squared! 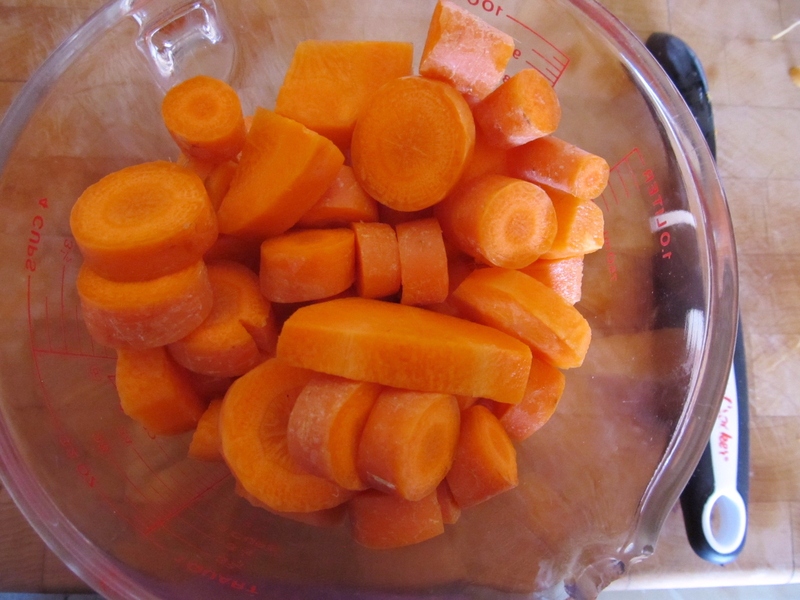 Start by peeling and chopping up about 6-10 carrots into bite-sized pieces. Personally, I only peel my carrots if I can’t get all of the dirt out of the nooks and crannies because you lose a lot of nutrients by peeling. You need to wind up with about four cups of chopped carrots. I have some very large, odd looking carrots from my garden, so my quantity of carrots to start was only about 4, plus a couple of normal carrots. 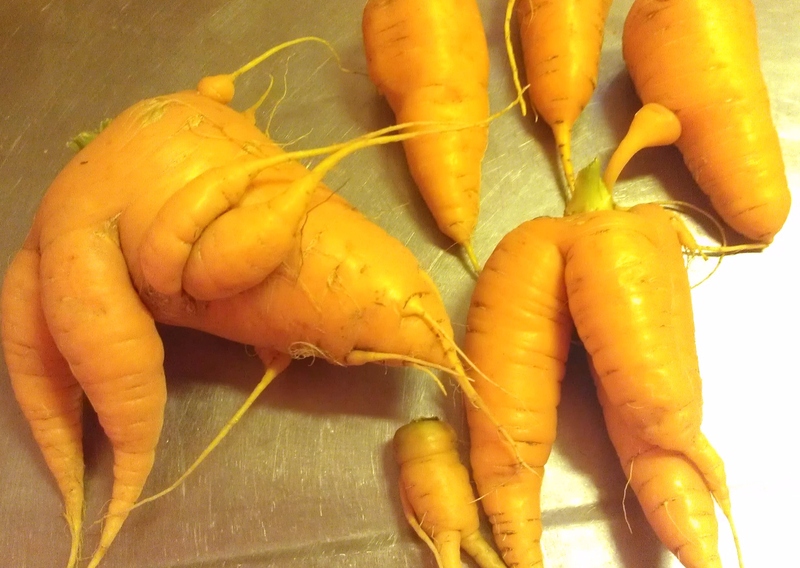 This is what happens when your carrots get “uneven watering” and you don’t thin them enough – freaky carrots! 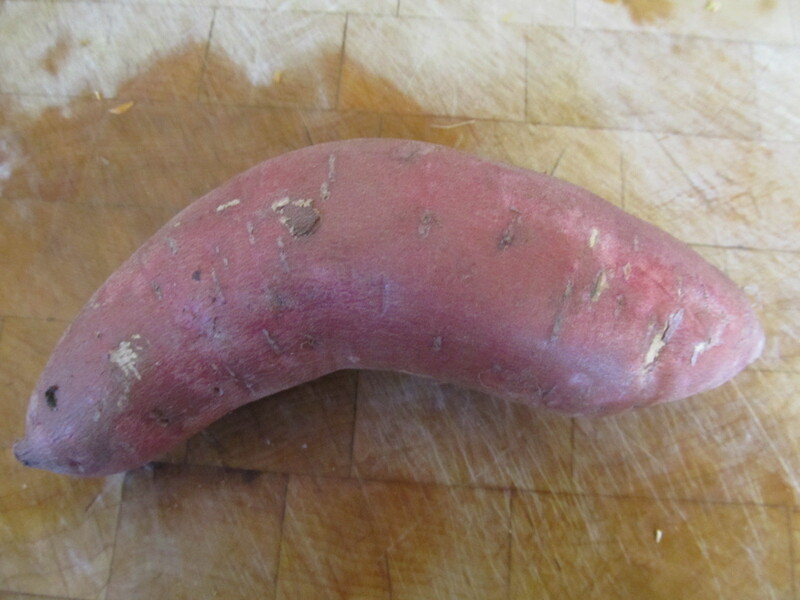 Next, peel and dice one sweet potato (or yam) and toss into a bowl with the chopped carrots. Peel a few cloves of garlic and add to the bowl. 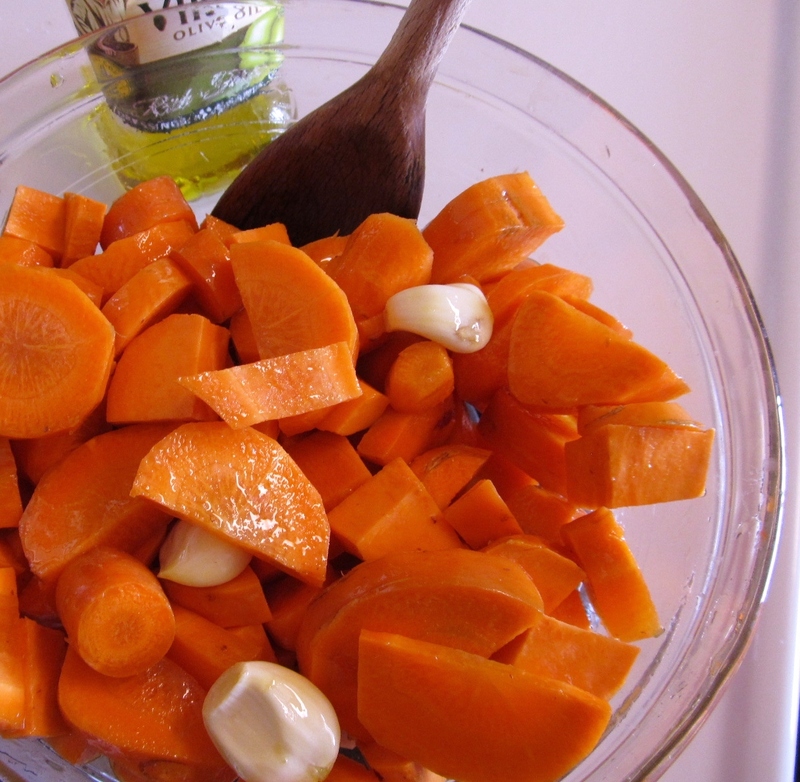 Pour about 1/4 cup of extra virgin olive oil over the mixture and gently toss to coat all veggies in the EVOO. If this process sounds familiar, it’s probably because it’s basically the same process described in my post about roasting cherry tomatoes. Yep, we’re going to roast these veggies before we throw them in the soup. Roasting brings out all kinds of flavorful yum in veggies and since it’s cooling off, we don’t mind having the oven on for awhile. Dump the mixture onto a jelly roll pan (rimmed baking pan) and spread veggies into a single layer. Sprinkle with salt and pepper. Roast at 425 degrees for 20-30 minutes until largest pieces are very tender. If they begin to scorch, move to lower rack or reduce heat to about 400. Each oven is different, so adjust accordingly. Roast at 425 degrees for 20-30 minutes until largest pieces are very tender. Be sure to taste test to be sure. While the orange veggies are roasting in the oven, caramelize an onion in your soup pot. The roasting and caramelizing both take about 20-30 minutes, so do other kitchen chores while they’re working. 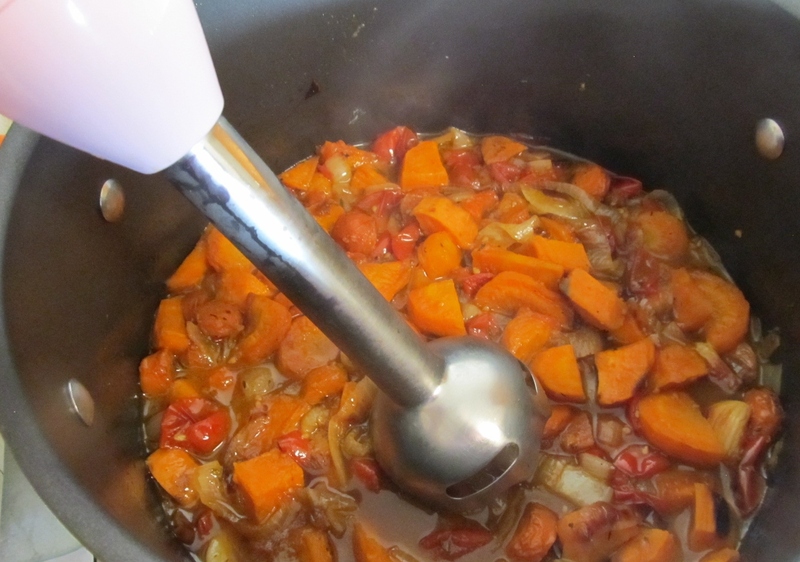 When the orange veggies are roasted, pour in some vegetable stock to deglaze the soup pot before adding veggies. Sidebar: speaking of veggie stock, you should make your own! Really! It’s super simple and it’s healthier than the commercially processed kind. Plus, you’ll always have some on hand when you need it. See my method for Easy Vegetable Stock here. I used about 2.5 cups of stock, but I like a thicker, heartier soup. If you like a thinner soup, use more stock. You can also add more after you puree it to get the desired texture. Bring stock and onions to a medium boil. 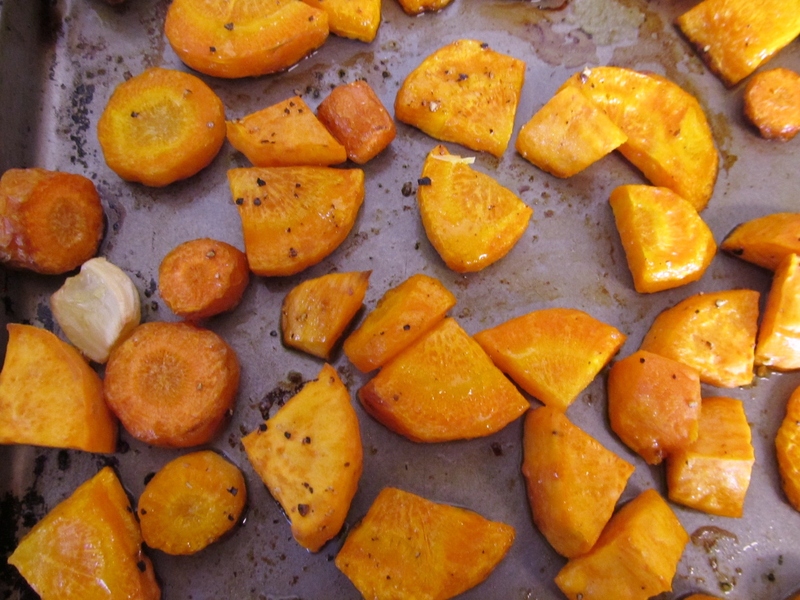 Dump the roasted veggies in the pot and add the ginger and thyme, with a little more salt and pepper. I decided we needed a little acid to counteract the sweetness of the roasted veggies and caramelized onions, so I added about two or three heaping spoons of my roasted tomato mixture from the fridge. If you don’t have roasted tomatoes, just chop up a couple of tomatoes and throw them in the pot. You cold also use about half a can of diced tomatoes, drained. Next, add the other secret ingredient: Worcestershire sauce. I know: weird, right? I don’t even know what’s in the stuff (no, I don’t want to know), but I swear by it in soups and stews. Adding it increases the richness of the soup exponentially. I only use a quick glug or two, but it makes all the difference. Trust me. To finish, you need to puree it. 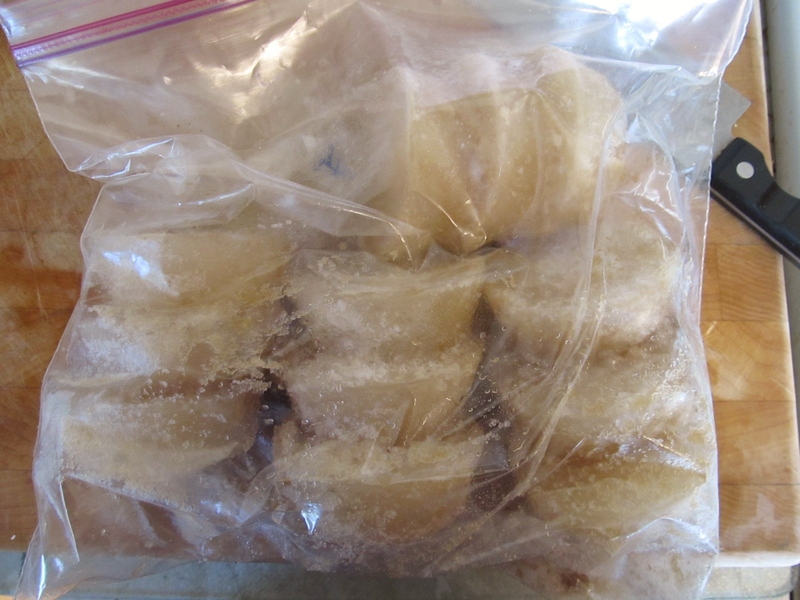 You can use a blender or food processor, but you’ll need to cool it to warm before doing so or it blows the lid off. Also, don’t overload the container; process in batches. I am lucky enough to own an immersion blender (and I highly recommend you invest in one, too), so I just buzz it around the pot until I get the right texture. The Hubs and I like some chunkiness to out soup, so I leave it pretty thick and don’t blend down all of the pieces (though I do try to get the garlic pieces all pureed in). Add water or more stock if you want a thinner consistency. Return pot to stove and reheat until hot. Simmer a little longer, or serve immediately. Garnish with whatever you like and have on hand. Some toasted nuts or pumpkin seeds would be lovely. Or, some cilantro or green onions would be good. I meant to add green onions, but the Hubs arrived and I got distracted and forgot. Crusty bread or toast makes a great dipping tool (too bad we finished the baguette with the chicken soup). Cuddle up under a flannel blankie by the fire and enjoy your orange soup! 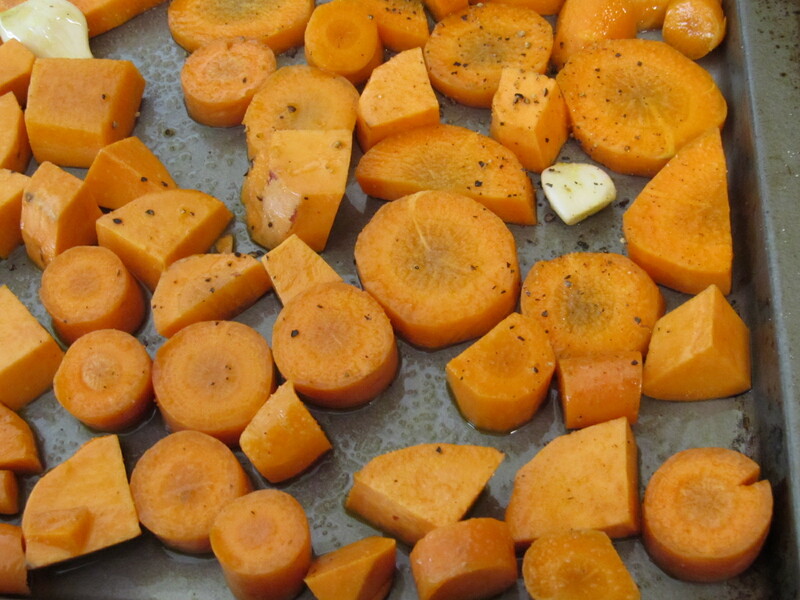 Combine diced carrots, sweet potato and garlic in a medium bowl. Toss withe EVOO to coat all veggies. Dump mixture on a jelly roll pan (rimmed baking sheet) and spread into a single layer. Sprinkle with salt and pepper. Roast in over for 20-30 minutes until the largest pieces are very tender. Meanwhile, caramelize the sliced onions in a large soup pot (see caramelizing instructions here). Deglaze the soup pot with a little veggie stock, then add another 2 cups of stock. Reserve the remaining stock to add as needed during the puree process. Bring soup to a medium boil, and add ginger and thyme and a little more salt and pepper to taste. Simmer on a low heat for about 10 minutes. 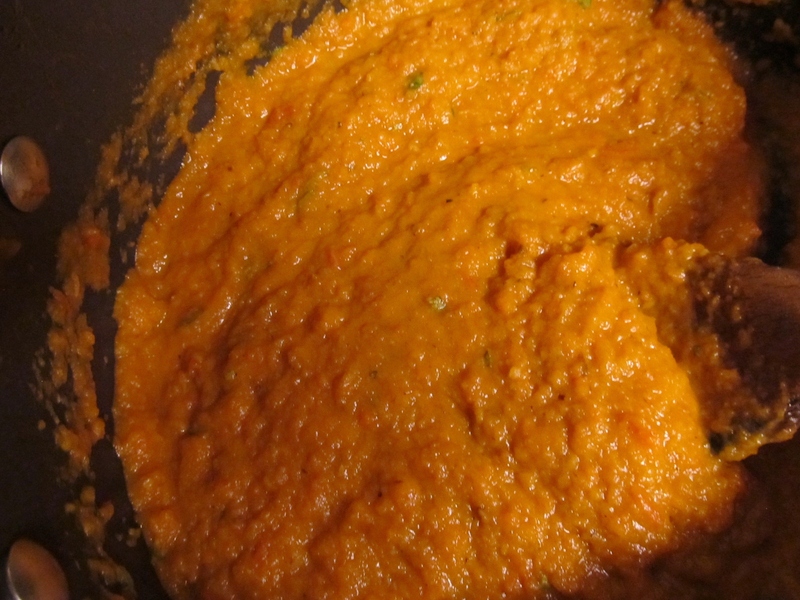 Puree in blender or food processor (cool to warm, then puree in batches) or using an immersion blender. Blend to desired consistency, adding stock if needed. Return to stove and reheat until hot. Garnish with nuts or seeds, green onions or cilantro. I like spicy food, but since the Hubs has a sore throat, I didn’t spice this recipe with anything other than the garlic and onions. Next time I would add some red pepper flakes or a little curry powder or paste to heat it up. I also might try using basil rather than parsley and I might add a little red wine to the soup. Another thought is to toss a little balsamic vinegar with the veggies before roasting. I also thought out adding some roasted corn after pureeing the rest of the soup. The Hubs liked his soup, but required a grilled cheese sandwich on the side to feel satisfied after a long day of working while sick 🙂 I was full after my bowl. 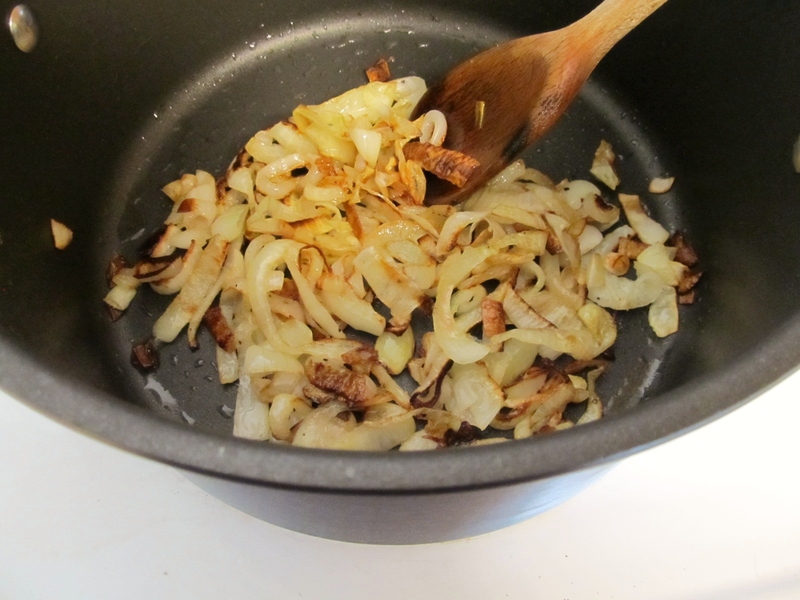 Caramelizing Onions – Oh how sweet it is! Categories: Cooking, Dinner, Garden, Sides, Soup, Veggies | Tags: autumn, Bountiful Baskets, Canning Tomatoes, carrots, Cooking, easy, Fall, food, Fresh, Garden, gardening, garlic, ginger, Grow, Harvest, healthy, homemade, Homemade vegetable stock, ingredients, low-carb, low-fat, Meatless, nutrition, onions, recipes, roasted vegetables, roasting, savory, scratch cooking, simple, soup, Sweet Potatoes, Thanksgiving, tomatoes, vegetables, Vegetarian | Permalink.